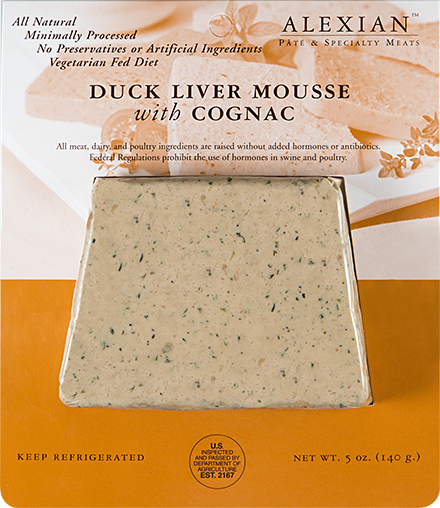 Made in New Jersey since 1982, Alexian proudly produces all natural pâtés and specialty meats. Alexian takes care in choosing the highest quality ingredients, using no fillers, artificial colors, flavors, or preservatives. All of our game, meat, poultry and dairy ingredients are certified to be free from added growth hormones and antibiotics. Our 20 pâtés are available in a variety of sizes for retail and foodservice, including our famous 5 oz. slice package. Alexian is a woman owned business, certified by the Women’s Business Enterprise National Council (WBENC). Where to Buy: Big Y, Food Emporium, HEB/Central Market, Lunds & Byerly's, Mariano's, Market District, Nuggets, PCC Markets, Publix, Raley's, Sprouts, Sunset Foods, and Whole Foods.